Anthony Cowin: Make Your Own House of Horror. Make Your Own House of Horror. Have you ever been sitting there alone at night worried that all the ghosts and killers are someplace else having a good time? Yeah me too. I thought it would be so much easier if I could have my own haunted house. But as I live in a small place I need small houses. Thankfully I discovered a site that can help me and you. What's that you hear from the window? Is that a silhouette of your mother calling? 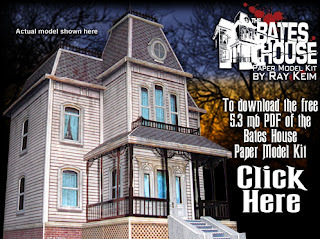 It can be now with a free project to build your own Bates House. You'll have to find a mini mummified mother to pop in there yourself however. Then pop over to Haunted Dimensions and check out there fantastic projects. Click the photo to find the Bates House. Just click the link and follow the instructions. What's that you say, you don't like serial killers for breakfast you prefer toast? Oh you prefer a ghost. Well if demonic possession is your thing then why not try the The Amityville House? Don't worry about repossession as this is free, no mortgage is needed. Possession may be a problem though. Click the photo to find The Amityville House. There's plenty more ghoulish projects on the site. If you like it why not donate a little too. Just never donate your soul. Above the City. Sci-fi Theme Music.